Of course you know you need to write a CV before you can start job hunting in earnest but like many things writing your first CV may seem a lot easier said than done. Thankfully CVs are just documents, so you can draft and re-draft as many times as you like before sending yours out to anyone. Use your first CV to highlight your skills, qualifications and experience, and be sure to use strong verbs to make it really pop. When you’re done writing, proofread for grammar and spelling, and format it so that your CV is crisp and clean for the reader. No sense making all of the effort to devise a great CV and then lose points for presentation! If you’ve only ever worked student or part-time jobs, it can be daunting to imagine making a full CV out of these positions. The good news is that this is not all that a CV should include. In fact, a CV is your chance to let employers see everything that you can offer them, including your skills, qualifications and experience. This means that in addition to previous employment you should be mentioning your education, voluntary positions and outside interests or skills as well. Name and contact details.Include home and mobile phones, email address and postal address. Education. Include secondary school as well as university history. Writing a CV can be hard for many people because you must use every single word to form a complimentary picture of yourself for future employers. If you find it hard to discuss your talents and achievements then most likely writing about them will be hard as well. Unfortunately, you must move past this. Run a spelling and a grammar check on your CV. Read each draft of your CV out loud to see how it flows. Have others proofread your CV to catch any minor errors. Ask others if your career objective is clear and your skill set matches this objective. Use clear margins to make your CV attractive. Print your CV onto good quality paper. 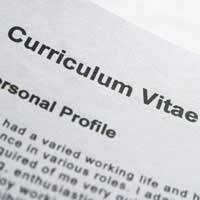 Writing your first CV can be a tense time, but it doesn’t need to be. Start writing your first CV before you ever leave school and university so that there is plenty of time to get help from others and look at templates no doubt stored in the career guidance office. Unfortunately, even once you perfect your first CV you’ll need to keep updating it every six months or so to add new achievements and skills. And if you’re ever tempted to lie or embellish your history? Don’t. It’s better to lose out on a job that you’re not ready for right now than to be branded a liar forever. I now know how to write a CV and its now basic and simple. Thanks for the imformation it has helped me alot. I need to write a CV for school, I'm starting sixth form and have been told to put together a cv about myself, I really do not know how the layout should be or how I should even begin, got any advice? Apart from all the advice in the article, you can find CV templates online if you want to search. I'm afraid we can't recommend any, but they are easy enough to find and combined with the article, they should help you complete your CV. @momo-chan Yes, or if you have had a part-time job at any point you could use this employer for a reference too. I have no reference. Should I put my school instead? if yes. Should I give a teachers name and the schools telephone number? @alina - you can take the advice of the article but miss out the professional experience, just listing your name and contact details - include home and mobile phones, email address and postal address. Education - including secondary school and whether you have any special responsibilities or achievements in the school. Then finish with nterests or miscellaneous skills, including language skills, computer or technical skills, or any certificates you have achieved such as Duke of Edinburgh awards etc. Your first employer won't be expecting a whole lot of experience to date. I hope this helps and good luck. I am a student at high school and it is my last year at school I am currently looking for a part time job and I dont have experience, what can I write on my cv?